Clever monkey babies, dusty lion babies, sleepy leopard babies, hair warthog babies. But which baby is the most treasured one of all? Mem Fox (Author) Mem Fox has written over 38 books for adults and children including Possum Magic, which has sold over three million copies and is the bestselling picture book ever in Australia. Mem has been presented with many awards including an AM in the 1993 Australia Day Honours for services to the cultural life of Australia; an SA Great Award for Literature in 2001; the Prime Minister's Centenary Medal in 2003; and she was shortlisted for the Australian of the Year in 2004. She worked as an Associate Professor of Literacy Studies in the School of Education at Flinders University, South Australia for twenty-four years and is now an international literacy consultant. 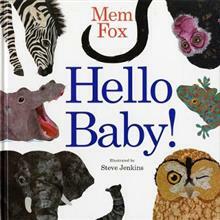 Mem's books with Penguin include Where is the Green Sheep?, Hunwick's Egg, A Particular Cow, Where The Giant Sleeps, Ten Little Fingers and Ten Little Toes, Hello Baby!, The Goblin and the Empty Chair, A Giraffe in the Bath and most recently Baby Bedtime. She lives in Adelaide, Australia. Steve Jenkins (Illustrator) Steve Jenkins is a graphic designer and artist who admits that his first love was science, an interest that shows through clearly in his interpretive art of animals. He and his wife collaborate often and run a graphic design firm together. He has three children and currently lives in Colorado. He has illustrated many books including the Caldecott Honor recipient What Do You Do with a Tail Like This?